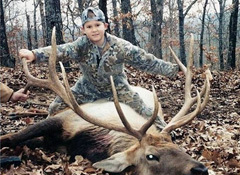 At High Adventure Ranch, we love to get youths involved in hunting and introduce new, young hunters to the challenges, enjoyment and thrills of the sport of hunting. We believe that it is necessary for the guide to take the time to explain the special characteristics of a specific animal and answer any questions that a young hunter might have. We consider it our duty to discuss animal habitat, the effect of a clean environment on wildlife in the future, and gun safety. Safety is always the first priority! When necessary, we also provide rifle practice at our onsite shooting range. Children under the age of 18 are required to be accompanied by an adult. We do not require that children have a Hunter’s Safety Certificate, however we HIGHLY RECOMMEND all of our younger hunters complete a hunter’s safety course. At High Adventure Ranch we treat everyone the same, from a child hunting for the first time to a handicapped hunter in a wheelchair to an experienced 72 year old hunter. We believe in making memories that will last a lifetime! 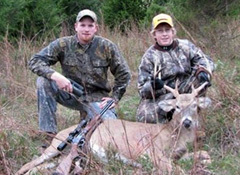 For more information on our Youth Hunts, please call (314) 209-9800 or fill out our contact form.